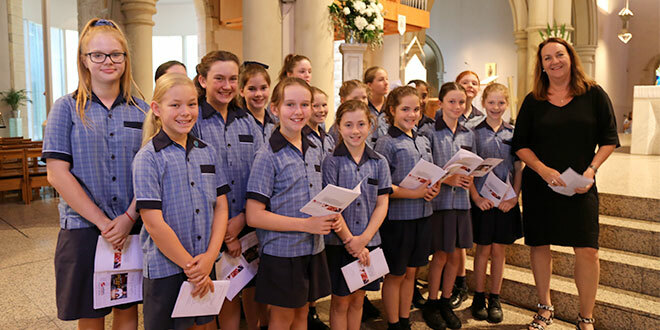 Young voices: The choir from St Peter and Paul’s School, Bulimba sang for the World Children’s Mission Day Mass at St Stephen’s Cathedral. HUNDREDS of Catholic school students marked World Children’s Mission Day by attending a Mass at St Stephen’s Cathedral, focusing on the plight of young Cambodians. “We are part of a global economy; how we live affects others,” Catholic Mission’s diocesan director David McGovern told students. Mr McGovern described the plight of a young Cambodian girl, Maly, who could not go to school because she had to stay home and mind her younger brother while her mother tried to sell shells in the streets. During the Mass, students placed significant objects near the Ambo, symbolising the suffering on the streets of Cambodia. A lock represented the cycle of poverty and a landmine warning sign represented the many children in Cambodia injured by land mines left there after a long war. A sheet of cardboard represented Cambodia’s many children live on the streets and unable to go to school and an empty pot, represented the many children in in desperate need of education and spiritual formation. Brisbane Archbishop Mark Coleridge touched on the importance of listening to the plight of the poor during a homily following the Gospel reading from Luke 13:22-30. “To learn the word obedience is to learn what it is to be a human being,” Archbishop Coleridge said. “Obedience means listening … you hear someone without really listening to what they are saying… you’ve got to hear what they are saying, understand what they are saying and then act upon what you hear. That’s what listening means. “And that word is right at the heart of the whole Bible. Listening, in the end, to the word of God. “Here today we say we are those who are prepared to listen with the ears of the heart to the children of Cambodia… you will hear cries of need, cries of sorrow, cries of children who had a leg blown off by a landmine. You will hear many things that perhaps you would rather not hear. “But you will also hear the love for children who in the midst of all their desperate need and sorrow have still learnt to laugh and smile. Archbishop Coleridge held aloft a book with a cover photo depicting a little girl sitting on a large water buffalo. “The contrast of her smallness and the hugeness of the buffalo is delightful,” he said. And the buffalo can’t do the work unless it listens to the little girl, Archbishop Coleridge said. “We are a bit like the water buffalo, because we are big in Australia. We’re rich, she’s poor,” he said. “And like the buffalo we say to the little girl we will carry you along on the journey, we will bear your weight… we have to learn to be obedient to them, to really listen with the ears of the heart to them and if we can do that, then we will be part of that turning the world on its head of which Jesus speaks when he says there are those now last, who like that little girl, who will be first, and those now first who will be last.